Forty years ago, a chardonnay and a cabernet sauvignon from California’s Napa Valley took top spots in a small industry tasting held in Paris. The wines were 1973’s Chateau Montelena and Stag’s Leap Wine Cellar, respectively, and they launched not only California’s wine renown but also inadvertently the global wine market we now take for granted. From that day, a new public perception was born: Quality wines could be found from places that weren’t France. The event, held May 24, 1976, was staged by English Paris-wine-shop-owner Stephen Spurrier. Looking for a playful way to introduce bottles from some of the United States’ fledgling winemakers — some with just two vintages to their name — Spurrier orchestrated a blind tasting (tasters aren’t told what’s in their glasses), pouring wines from Bordeaux châteaux like Mouton-Rothschild and Haut-Brion and those from unknown American wineries like California’s Ridge, Stag’s Leap, Freemark Abbey, and Martha’s Vineyard’s Heitz Wine Cellars. The tasting table held 11 judges, all members of France’s elite wine ranks and all French except Spurrier and l’Academie du Vin’s American director Patricia Gallagher. Among these winemakers, writers, and restaurateurs sat the sommelier of Paris’ 400-year-old La Tour d’Argent restaurant — whose dishes and wine cellar have long been considered a hallmark of French gastronomy — and a member of the French Institute of Appellations of Origin, the regulating body of France’s stringent wine quality- and tradition-control system. The judges tasted and ranked a mixed section of Old World and New, with only their senses to guide them through their unmarked glasses: white Burgundy and stateside chardonnay were poured side by side, U.S. cabernet sauvignon beckoned alongside red Bordeaux. The Americans won. The first press coverage of the day — a four-paragraph “filler” story headlined “The Judgment of Paris” buried in the Modern Living section of Time magazine’s June 7, 1976, issue and written by the sole journalist present — resonated with a newly wine-curious American middle class and launched a market for New World wines along with a flurry of Gallic indignation. Judge Odette Kahn, editor of La Revue du vin de France, who had unknowingly given top marks to two California bottles, demanded her ballot be withdrawn. Re-tastings in subsequent years were held in order to check the Californian wines’ ability to age, and the subjectivity of tasting in general was cited as proof of invalid judging. But the damage to France’s market status as the great wine provider was done: The United States entered the serious wine game that day. California was soon joined by Oregon, Washington State, New York, and Virginia, all now recognized as quality wine states. Wine is susceptible to trends, and today, wines that express that once-French-only concept of terroir and are made from grapes grown in soils and climates that suit them well are increasingly sought after. In response, showcasing place has become quality U.S. wine’s new job. A less-stringent answer to France’s AOC system, American Viticultural Areas — defined geographical boundaries that identify climate and soils unique to a place and are approved and overseen by the U.S. Treasury’s Alcohol and Tobacco Tax and Trade Bureau — are growing in number, with new AVAs awaiting approval this very moment; some unofficial, for now at least, zones are proving their worth the irrefutable way with bottle after delicious bottle. If 40 years ago can be defined as traditional, then now there are new, nontraditional states garnering attention as producers of quality place-specific wines, among them Arizona, Vermont, Idaho, Colorado, and New Mexico. Maynard James Keenan is known as the singer of experimental rock bands Tool, A Perfect Circle, and Puscifer, but also for his Caduceus Cellars winery that he runs with his wife, Jennifer, in northern Arizona’s Verde Valley, one of Arizona’s three major winemaking zones. Verde Valley’s AVA status is currently pending, but, like current AVA regions Sonoita and Millcox, it has an arid, desert-like climate. Along with elevations above 4,000 feet and a jumble of weather patterns that include hot days and cool nights, dust storms, summer rainstorms, and winter snow, the land has a distinct volcanic influence. Although none of them are active today, what is now Arizona has been home to thousands of volcanoes over the past billion years, creating soils that vary from limestone-like rock to river sediment-covered calcareous foundations to the southward foothills of Mingus Mountain, where the grapes that become Keenan’s more-accessibly-priced Merkin Vineyards bottles are grown. Keenan planted his first vines in 2002, on a seemingly barren landscape mostly devoid of other vineyards. In the 2010 documentary Blood into Wine about the Caduceus winery, those sites look practically lunar. There, he grows chardonnay and malvasia along with Italian natives like sangiovese, aglianico, nebbiolo, and barbera, and Spanish mainstays like tempranillo — all with the aim of establishing Arizona terroirs as among the nation’s best. The first La Garagista vintage was 2010, with small runs of two wines: Vergennes-Blanc and Vergennes- Rouge. This alpine Vermont wine is already proving itself a success. The couple has since added two more vineyards to its farming efforts: leased parcels in Champlain Valley and West Addison. Across the road from the homefarm, a third site has been planted in collaboration with their neighbors to supply ingredients for the brandies they plan to make soon, too. “The soils in Vermont are some of the oldest in the world, which makes them particularly interesting and venerable with loads of potential and possibility for terroir-driven wines,” Heekin says. All La Garagista vines are hybrids, and about seven varieties grow there now. 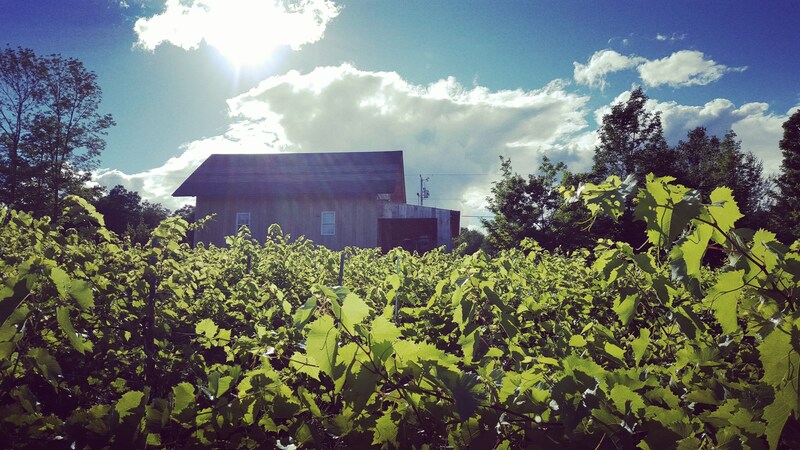 Les Bonnes Femmes, La Gragista’s homefarm vineyard, is planted with a hardy field mix of Marquette, La Crescent, Frontenac Noir, Frontenac Gris, Frontenac Blanc, and St. Croix hybrids. “Once we started seeing the kinds of wines the hybrids can produce and how they interpret our terroir, we’ve been so excited by the possibilities,” Heekin says. “I love that these varieties are also uniquely American, they are a big melting pot of this native stock and several European vinifera varieties.” With lands that range from the Champlain Valley’s clay and limestone to volcanic soils in the mountains, hybrids offer an additional bonus: “I find it exhilarating to have the freedom to let those varietal expectations recede and really let the terroir of each different parcel speak,” Heekin explains. The Rockies provide a viticultural mountain climate, too, with vineyards at some of the highest elevations in the world. In the Grand Valley AVA in the western part of the state where cherry, peach, and apple trees grow, Sue and Doug Phillips run Plum Creek Winery, which they founded in 1984. Four years earlier — the minimum amount of time it takes for a young vine to bear grapes fit for wine — they planted their 11-acre vineyard with grapes like cabernet franc, riesling, and gewürztraminer, thinking if other fruit thrived there, so might grapevines. In the successful decades since, varieties like sangiovese, sauvignon blanc, and syrah have been added to the mix, and the terroir has been compared to France’s Rhone Valley and parts of Germany. Today, Plum Creek is Colorado’s oldest still-operating winery, with a total vineyard size seven times the original. The Phillips’ sites also include plantings of chardonnay in Colorado’s other AVA, West Elks, where vineyard elevations reach close to 7,000 feet. There, bottles reflect the high-altitude, cool climate side of the grape variety. The state’s latest AVA, Lewis-Clark Valley, was approved in early 2016 and borders eastern Washington, who will share the designation. Grapevines were planted there in the mid-nineteenth century, but were felled by Prohibition and not revived until the 1970s. But the comeback has held a steady if contained pace. Today, there are 1,200 acres of vineyard — auspiciously, not enough to satisfy a growing thirst for Idaho wines — in which cold winters, cool nights, warm days in the summer fruiting season, and plenty of sunshine could help this Pacific Northwest state’s reputation catch up to that of its two better-known neighbors. Idahoan farmers Gary and Martha Cunningham founded their 3 Horse Ranch Vineyards in 2002, within the Snake River Valley area, Idaho’s first AVA in 2007. Geographically defined by the boundaries of the ancient Lake Idaho bed, the land is rich with volcanic sediment from eras past. The Cunninghams farm naturally, following organic principles and relying on weed-pulling, cover crops, and helpful insects like ladybugs and wasps in place of chemical pesticides and herbicides. Their section of Bordeaux varieties, cabernet sauvignon, merlot, and the much-lesser-seen petite verdot, is a nod to their careful attention to which vines thrive here — as do syrah, mourvédre, pinot gris, riesling, syrah, and viognier. All grapes are harvested by hand then vinified by winemaker Greg Koenig, who also runs his own eponymous vineyard and makes wine for the single-vineyard-focused Koenig Distillery and Winery. Late last year, a third Idahoan AVA was approved. 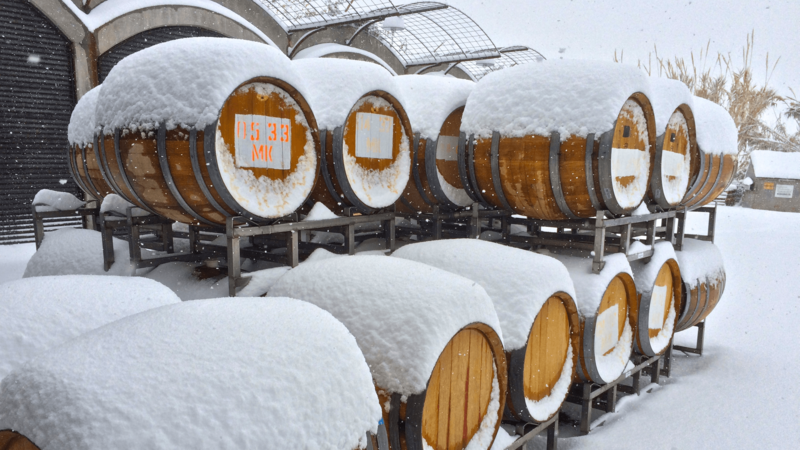 The new Eagle Foothills is a subsection of Snake River Valley, and, at close to 3,000 feet in altitude, it offers both precarious growing conditions and the promise of concentrated flavors and structure-providing acidity in gentler years. Already Eagle Foothills’ difficult personality is evident: Two of 3 Horse Ranch’s 2014 bottles hail from within its boundaries, the Phillips’ first vintage from the new AVA — their 2013 crop would have been eligible had it not been destroyed by a particularly harsh winter. The dry, warm landscape that would become New Mexico was first planted with grapevines in the early seventeenth century by Spanish monks. These vineyards were among the first in what would become the United States. The fruit — mission grapes, called criolla in Argentina and pais in Chile — was used to make sacramental wine, a crucial component of Roman Catholic priests’ daily Mass. Over the centuries, the wine industry would expand along the Rio Grande, where elevations up to 6,000 feet provided cooler nights and winters, tasty growing conditions for wine grapes. A cast that reads like a partial history of the United States drove that expansion: Jesuit priests, French and Italian winemakers, and a French archbishop all helped build the increasingly large wine country here. But by the early twentieth century, New Mexican wine was in steep decline; a fatal mix of competition from nearby California, the Rio Grande’s steady destructive floods, and Prohibition ended centuries of winemaking tradition and destroyed heritage vineyards. But the land retained its promise, and in the 1980s the industry began a slow climb that continues to this day. The most successful example yet is Gruet Winery, well-known for its high-quality, affordable sparkling wines, made from New Mexico-grown chardonnay and pinot noir. Founders Laurent and Nathalie Gruet planted their first vines there in 1984, after leaving their native Champagne to seek new winemaking grounds. They found them near the hot-springs town of Truth or Consequences, on a site within Middle Rio Grande Valley, one of the state’s three AVA’s, a high desert climate with cool nights that preserve grapes’ acidity — a crucial feature in sparkling wines — in the face of intense daytime heat. Consider this one part premonition: Evan Lewandowski’s winery is in Salt Lake City, but for now the wines under his Ruth Lewandowski label — from the Hebrew Bible’s Book of Ruth, whose tale of death and redemption inspire Lewandowski’s thoughts on wine — are made of grapes from Fox Hill Vineyard in California’s Mendocino County. He begins winemaking in California then drives those vats of fermenting must back home to Salt Lake City, where his wine is finished and bottled. Here, from some of the up-and-coming winemaking states, new and old, are six wines that offer a sensory confirmation of place, stateside.